Punjab Congress president Captain Amarinder Singh on Monday vowed to put behind bars all those found guilty of religious sacrilege and other crimes against the people of Punjab, even as he made it clear that not a single subsidy would be withdrawn after his party comes to power in the state. Addressing a huge gathering of people at the annual Jor Mela here, Captain Amarinder condemned the spate of incidents of sacrilege in Punab in recent months, saying such religious attacks would not tolerated and those responsible for these incidents would be punished.Citing incidents of burning and tearing of the holy texts, such as Guru Granth Sahib, the Bhagwad Geeta, Quran Sharif etc, and the sacrilege and police firing in Bargadi, Captain Amarinder said these underlined the state of lawlessness and communal polarization into which Punjab had been plunged during the Badal regime.Captain Amarinder appealed to the people to vote for the Congress to save the state from the Badals and Bikram Singh Majithia, who were only interested in promoting their own interests and filling their pockets. He questioned where the Badals had got the money for Sukhvilas and other personal projects and businesses.Accusing Majithia of selling drugs, Captain Amrinder said he and the Badals had ruined an entire generation of youth in Punjab. The drugs problem was so widespread that in his former Lok Sabha constituency of Amritsar there were many villages without a single surviving male member as all had fallen victim to Chitta, he revealed.Deprived of employment and jobs, the youth were being pushed into drugs by the Badals and Majithia who were patronizing the state’s drugs mafia, said Captain Amarinder. 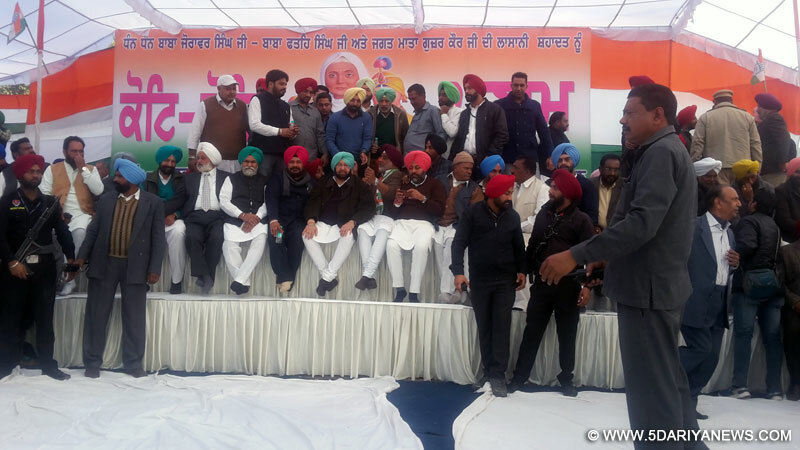 The Punjab Congress president also attacked the Badals over the 300-odd political appointments made in the past few days in violation of all norms, in a bid to place their own people in plum positions ahead of the imposition of the code of conduct.Nailing Badals’ lies in this regard, Captain Amarinder asserted that not a single public subsidy would be withdrawn by his government after coming to power. The next Congress government would not only continue to give free power to the farm sector but will also reduce the power tariff for the industrial and commercial consumers, Captain Amarinder announced.Reiterating his promise not to allow a single drop of water to go out of Punjab, Captain Amarinder declared, “The Akali government led by Parkash Singh Badal failed to protect the state’s rights in the SYL case but I will fight on it till my last breath.”Pointing to the series of farmer suicides, as well as the industrial collapse in the state, Captain Amarinder reiterated that he would waive off all the debts of the farmers and ensure the revival of the industries. He lambasted the Badals for scrapping the mega project scheme he had launched as chief minister to generate jobs for the youth and promote industrial development in Punjab. Captain Amarinder promised the people that all their woes would be addressed in the Congress manifesto, which was under preparation for the last one year with inputs being taken from all sections of Punjab’s populace.He also promised the people of Fategarh Sahib that their long-pending demand for the construction of a bus stand in the area would be fulfilled by his government after the Assembly elections.Captain Amarinder was joined on this occasion by several Punjab Congress MLAs, including Kuljit Nagra, Balbir Singh Sidhu, Gurkirat Kotli, Randeep Nabha, Sadhu Singh Dharmsot, Jagmohan Singh Kang and Amrik Dhillon.All the Congress leaders appealed to the gathering to strengthen the hands of Capt Amarinder Singh to bring Punjab back to its golden age.Fatehgarh Sahib MLA Kuljit Nagra flayed the Badals for ruling Punjab like dictators, saying even women and elderly were not safe in the `zulmi raj’ of the father-son duo. Only Captain Amarinder can teach a lesson to the likes of the Badals and Majithia, who deserve nothing less than being thrown into jail, he added.Expressing concern over the mushrooming of liquor vends in the vicinity of a sacred place like Fatehgarh Sahib, he urged Captain Amarinder to close down all such vends after coming to power.